The fight near the City College Academy of the Arts school building left two students injured, police said. 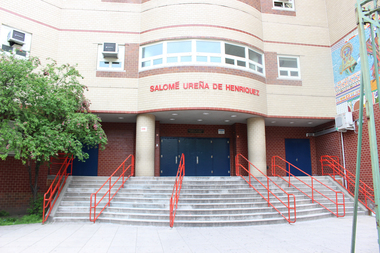 WASHINGTON HEIGHTS — A pair of teens used a wooden stick to beat two students near a Fort George high school in an attack that involved dozens of onlookers — making some students fearful to go to class, police and parents said. The attackers, 16 and 17 years old, were arrested Monday for striking the two 17-year-old students in the head with the stick, leaving one with small cut above his right eye and the other with a lump on his head, the NYPD said. The beating took place near the City College Academy of the Arts at 4600 Broadway on Monday, nearly two hours before the assailants were caught at about 4:23 p.m. on 189th Street and Amsterdam Avenue, police said. The attackers did not attend the school, and it was unclear if the victims did, police said. Both students were taken to Columbia Presbyterian Hospital after the incident for treatment, police said. While authorities confirmed that only two teens were injured, parents and law enforcement sources said the melee included up to 50 people looking on. Gerald Morales said his son, a student in the 10th grade at City College Academy of the Arts, ran home from school that day. "His shirt was all sweaty," Morales said. "He was scared." Like other parents, Morales said he was disappointed that the school didn't contact him until late the following day. "I was calling all day, and finally the school left me a voice message," he said, adding that it was a general, automated message. Fidelina Rodriguez said she also received the automated call from the school, but only after she kept her son out of school on Tuesday. She also tried calling the school throughout the day, to no avail. Parent Linett Fernandez said her daughter asked to be picked up from school on Tuesday morning because she was fearful of more violence. It was only late in the day Tuesday that the mother received an email from the school about the incident. “They said they're going to shuttle the kids and working with police," Fernandez said, adding that her daughter was scared the attackers would return to the school. "Anything can happen," she said. "But it's good that they're trying to prevent a disaster." The attackers were charged with second degree assault, police said. The DOE said the school is continuing to update families about the situation.